The impact of revelations that police officers operating undercover mounted long-term infiltration of protest groups is continuing to be felt - and one area where information is still coming out involves trade unions. In 2009 it was revealed that The Consulting Association, a secret organisation set up and funded by the construction industry, had kept files on thousands of workers. The personal information gathered included details on where people lived, newspaper clippings, gossip from site managers, notes from union meetings – even graffiti from toilet walls. These files were then used to vet potential employees and keep out potential troublemakers. An analysis of the files released so far show that raising health and safety concerns and being a union activist was the most likely way to earn oneself a place on the blacklist. The Information Commissioner’s Office (ICO) raided The Consulting Association, seized its files, prosecuted Ian Kerr, the man who ran it day-to-day, for breaching the Data Protection Act and warned the companies who had funded it to behave themselves. A 16-year spying operation had come to an end. But its secrets would only slowly start to spill out – pieced together by journalists, activists and lawyers. One of the deepest secrets was the involvement of the security services. Evidence now coming to light suggests this involvement has been standard practice in the state's treatment of trade unionists. Following the raid the ICO was confronted with an unusual problem. It now possessed 3,213 files of illegally held personal data which individuals knew nothing about but which may have affected their working lives for many years. It took the decision to become, in effect, the data controller for these files. If someone believes that they may have a file then they can ask the ICO to check and, if correct, receive a redacted copy. 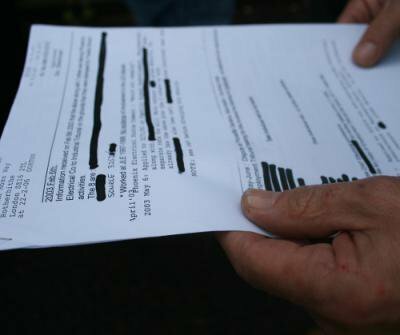 The realisation that information from the police, including undercover officers, ended up on blacklisting files has emerged as people inspected their personal data. A blacklisted worker holds a copy of his file. Photo: Phil Chamblerlain / Creative commons. One person who Ian Kerr kept a file on was Ellenor Hutson. Today she is a welfare rights officer living in Glasgow but during the mid-1990s, she was a road protester at the Newbury By-Pass, the A30 link road in Devon and the Manchester Second Runway. It didn’t occur to Hutson that she might be on a construction industry blacklist until a letter dropped through her letterbox. “I was on maternity leave from work,” she said. “A letter came though from UNITE saying I was on a blacklist. It was just random luck that I was a member of UNITE at the time. I put on Facebook that I had got this letter. I got talking to people about this and I realised I had opposed a lot of the projects the big firms were running." After setting up a Facebook page, Hutson discovered dozens of people she knew from the 1990s were on the blacklist. We know Hutson has a file because her name is in a ring-binder seized by the ICO which was a master list of all the names along with home town and date of birth – but we don’t have her file. In evidence to Parliament to 2012, the ICO admitted that when it raided The Consulting Association it had not seized everything. It only took the material it believed was covered by its warrant and related specifically to the construction blacklist. Kerr, who began his career monitoring ‘subversives’ in 1969 with the Economic League, told MPs that he had around 200 files on environmental activists. Having a Consulting Association file does not automatically suggest police involvement. However, it is clear that anti-roads protestors were of intense interest to the police and a lot of intelligence was gathered on them. It seems logical that construction companies, if they had a system set up for trade union members, would look to expand that to other people who might cause them trouble. As we shall see later, Kerr admited to links with a police outfit monitoring 'subversives'. We have tantalising evidence of how the flow from officer on the ground to police file to construction company and to Kerr might have worked. According to Hutson, though, it could only have been information from the police that led to her having a Consulting Association file. She says she was arrested between seven and ten times and each time was asked for her date of birth and her home town – the same info as appears in the masterfile. She would not have given that detail to private security guards or detective agencies and there were no press reports. One person with a now destroyed file is listed as Grace Quantocks (The Quantocks is a range of hills in Somerset). Hutson points out that it was standard practice for activists to adopt the name of a landmark as a surname and give that to the police. Hutson would have first come to the attention of the police as a 16-year-old when she took part in a demonstration in London in support of striking transport workers. She and a group of others ended up occupying London Transport offices and were arrested. Unknown to her, one of those involved was Jim Sutton. Known to colleagues as 'Grumpy Jim', Sutton was actually Jim Boyling, an undercover police officer who had targeted Reclaim The Streets. Another undercover officer took a much closer interest in the activities of construction union members. In 1994 a man calling himself Mark Cassidy appeared in Stoke Newington, London, and gravitated towards the Colin Roach Centre. However Cassidy’s story about being a builder who had lost his father to a drunk driver and come down to London looking for work was just that, a story. Cassidy’s real name was Mark Jenner and he was an undercover spy for the Special Demonstration Squad (SDS). Mark Metcalfe, who worked at the centre at the time, has written about the myriad causes Jenner was involved in and says that the damage caused by his infiltration is still being felt. The centre was also home to the Brian Higgins Defence Campaign set up after a UCATT union official sued union member Brian Higgins for libel. Running to 49 pages, Higgins has the largest of all the blacklist files released so far. Jenner became the secretary for the defence campaign. It may be coincidence but there are entire pages of Higgins' blacklist file which simply record the names of his “Known Associates” dating from around the same time that Jenner was chairing these meetings. Another person who knew Jenner at the time was Steve Hedley, who is now assistant general secretary of the rail union the RMT. His blacklist file covers around 15 years and is filled with details on what he said at union conferences, his involvement in health and safety activities, disputes he took part in and his political views. Hedley was introduced to Jenner at the Colin Roach Centre. When Hedley went to Ireland as part of a delegation for the Bloody Sunday March the undercover policeman stayed at Hedley’s mum’s house. One of Jenner’s targets was Alison (not her real name) who was in a relationship with the undercover spy for five years. Jenner cultivated the relationship in order to bolster his cover. Alison remembers numerous conversations with the SDS spy about the building industry and union campaigns, which seemed to be “a big part of what he did during this period”. During Jenner’s time he attended picket lines over unpaid wages at Waterloo and ferried construction union activists to demonstrations. A source familiar with Special Branch activities against trade unions has suggested that the branch’s industrial desk, responsible for liaising with and monitoring trade unions, may well have tasked Jenner with gathering information on union activists. In the case of Hutson, Stewart and many others we only have the names and no files. It took a lucky break to identify particular files that strengthen the suspicions of a police link to this private spying operation. As part of an employment tribunal against Carillion, blacklisted engineer Dave Smith was granted a third party disclosure order against the ICO for all the files that related to him. Since the ICO had a lack of staff they suggested that his solicitor could come up and look at the files himself. And because the solicitor was doing it pro-bono he suggested that Smith went instead. With the chance to look through the ICO's unredacted file, Smith found the files of two people he knew, Dan Gilman and Frank Smith, and realised that the police must be involved. There were references in these files only the police could know about, and which only Smith would have realised the significance of. This fluke brought police involvement in the blacklist further to light. The information in Dan Gilman and Frank Smith's files contains details of the police questioning the two when they were stopped on their way to an anti-fascist rally. It is highly unlikely that any building firm employee would have seen them being questioned. They were not arrested. There was no press coverage. Gilman has never even worked in the building trade. Yet the information appears on a construction industry blacklist. Indeed a line in Frank Smith’s file says: “Under constant watch (officially) and seen as politically dangerous.” A bricklayer by trade, Smith is a long-time political activist who has been involved in a number of actions on building sites across London calling for better wages and conditions. A source has confirmed that Special Branch opened a file on Frank Smith because of his involvement with anti-fascist activity. The Times reported that, in return, the Netcu officer asked the companies to pass on their own information about potential troublemakers, and Mr Kerr said that a “two-way information exchange” opened up. The ICO has information from this 2008 meeting but has refused Freedom of Information requests to release it. The Metropolitan Police says it does not hold any records from this meeting. This is hardly a British problem. The latest edition of the journal International Union Rights details evidence of blacklisting around the world, whilst IKEA’s behaviour in France provides just one example of police collusion. UK blacklisted workers are demanding that the only way to understand the nature of the links between the security services, undercover officers, union activists and the construction industry is for it to be included as part of the public inquiry announced by Theresa May.